One of my favorite places to eat is Cracker Barrel. For a while now, they have been advertising Campfire Specials – tin foil pouches of beef or chicken and veggies cooked on a grill. 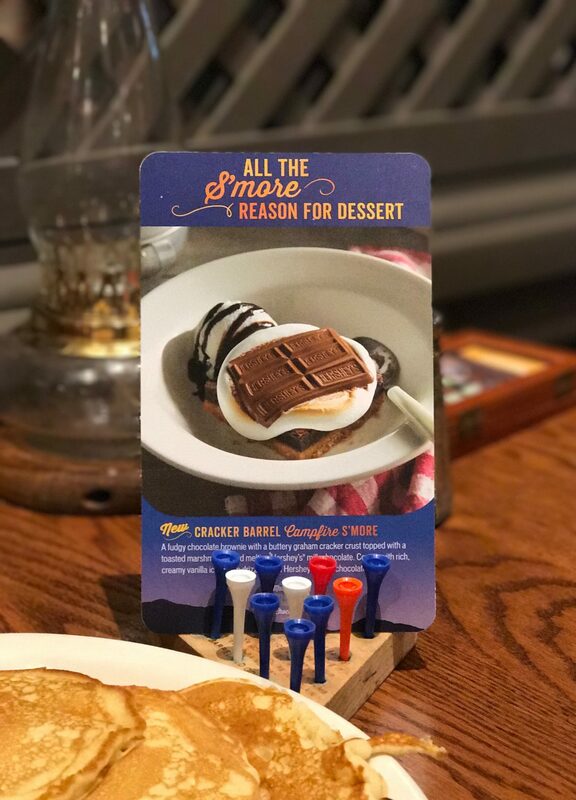 That’s not really my thing but on the table is an ad for a campfire dessert – a s’more dessert. I love love love s’mores. They bring back all sorts of fond memories for me. Camping. Stars. Night air. Hikes. That one time we decided to buy a fire pit so we could invite people over just to grill hot dogs and have s’mores in the backyard. Anytime we wanted. And then we sold the fire pit in the great downsizing of 2015 and regretted it. And bought another fire pit. Which we lug everywhere. Yeah. I like s’mores. And fire pits. 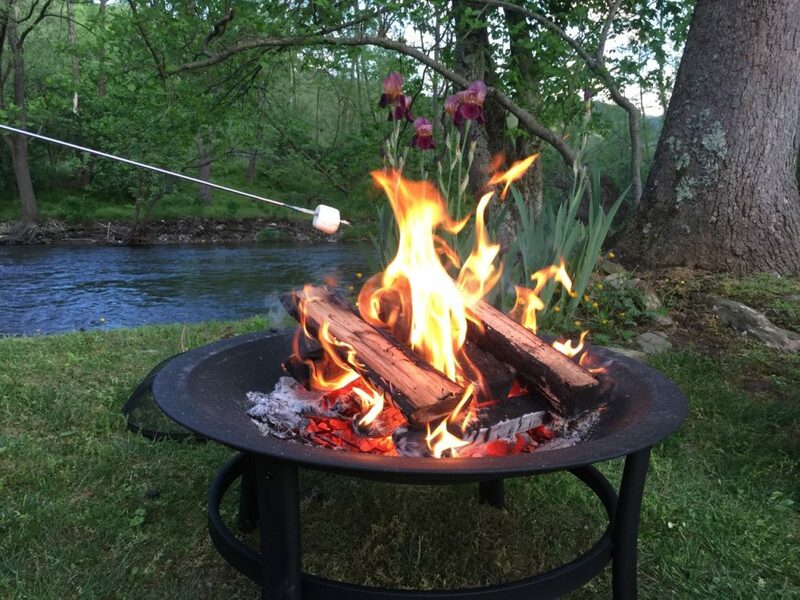 I had my son make a short list of things he definitely wanted to do this summer – and the fire pit and s’mores was on it. So back to Cracker Barrel. And the S’MORES. Well the dessert card looked really tempting, but I’ve been intentionally cutting back on my sugar. Mostly just not drinking sweet tea, but not ordering dessert either. So I would glance and then order my dinner. This happened several times over the course of a month or two. I knew the days I could order the dessert were limited. After all this was a seasonal thing – limited time only. And I was ok with that. Then I got a text from a friend. Someone had died. Unexpectedly. Not someone I knew. But related to someone I had just met. Just a week ago this person’s world was intact. Not knowing what this week held. I was sad for them, for their family. Then another person died. Unexpectedly. That’s the way it happens, they say. Whoever ‘they’ are. In threes. This time I found out on Facebook. Someone I knew. Someone my daughter knew. No time to say goodbye. We had spoken just last week about getting together. A friend called and said she was going to break away from work in the middle of the day. Which, by the way, is almost impossible for her to do. She would meet me at Cracker Barrel. We had the s’mores. Not because life is short and s’mores are delicious. Although that is also true. But because it is good to realize that everything is for a limited time and to soak in each good part. My son might be driving next year. Best to soak in each time he needs me for a ride. He still lets me check out book selections from the library. I’m sure that will not always be the case. It makes me happy when he likes my book picks. I’m going to soak that in. Soak in an ordinary lunch with a friend because ordinary can get awfully scarce sometimes. Soak in friends who don’t mind you pulling in their driveway without calling first. Soak in a perfect temperature sunny June day with kids doing cannonballs in the background. It’s all around us. Blessings. Each for a limited time. Oh, more will come. But not these. Look at these while you can. Looooooooooove this post. Not just because I’m your soul sista on the smores front … I’ve literally walked by the smores end-cap at W-mart 4x this summer and twitched every time (I softly whisper to myself – you have the ingredients at home, you don’t need a 6pk of Hershey bars, look away, look away I say) … but also because I needed the reminder to “relish the charms of the present”.